The thing that is keeping me back most on this trip is my mind… It is hard to say but my mind is really screwed up sometimes. The last three days have been the hardest days for me on this trip. I was almost ready to call it quits. 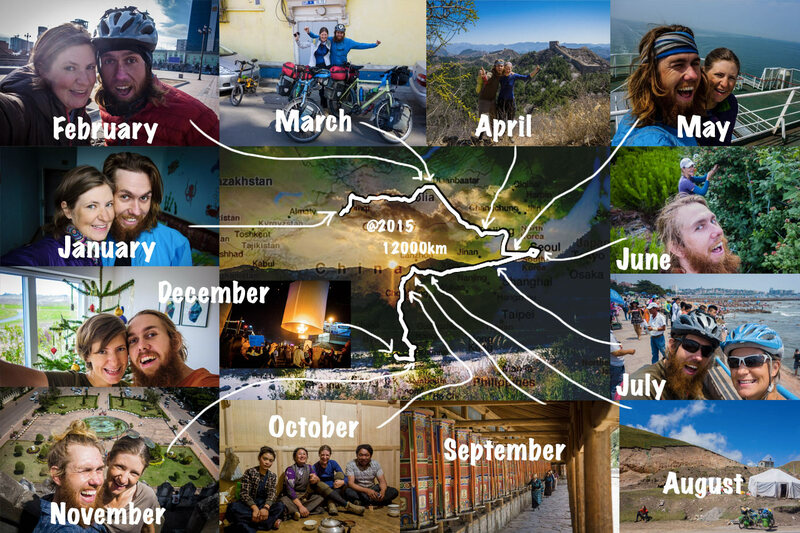 My mental battle of bicycle touring, how did it get so far? Martin and I always thought that the first weeks on the bicycle would be the hardest for me. I was not fit, struggling with a winter dip and I don’t like the cold. We were going to cycle through the Alps in winter, so it was going to be cold. And although those first weeks were really hard they have been beaten by my mind and body over the last few days. 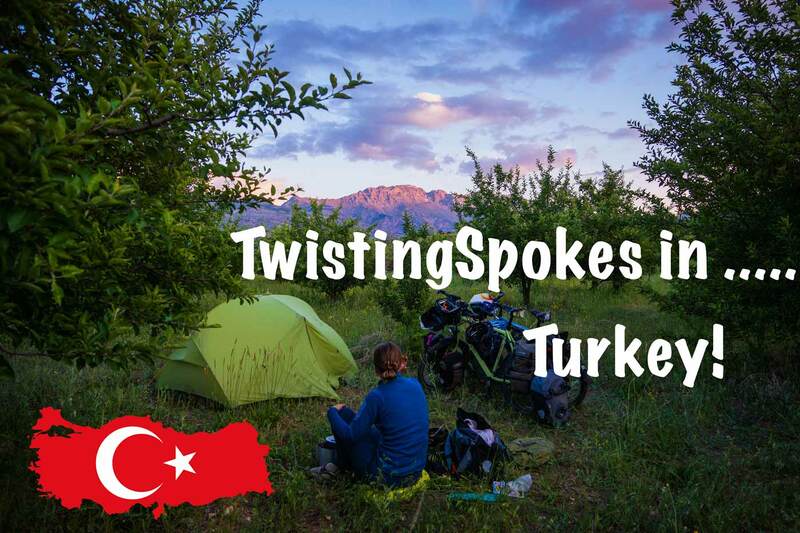 Not only the cold is tough for my body, the heat is almost worse… After pooping my guts out in Mardin and while being on the bicycle, we decided to stop in a hotel in the hottest city of Turkey. Not the best idea, it was too hot. 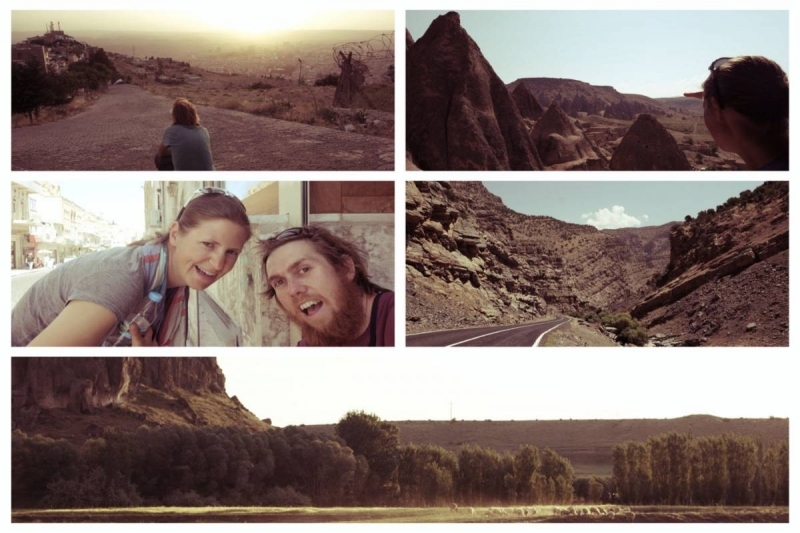 I then took my first hitchhike after breaking down after 10 km and we stayed in Sirnak for two nights. My body was not really ill but I was still going to the toilet and it was really hard for me to eat anything. When leaving Sirnak my body was not strong, there were mountains coming, my mind had grown fond of the idea of hitch hiking and my head crashed. Martin is used to me having breakdowns now and again. I have never seen myself as being a very physical active girl or woman and the trust in myself is therefor fragile. On good days I really believe that I can do this. On bad days I really can not believe that I can do this. Martin believes in me and my capabilities and tries to ensure me that I can trust myself to bicycle up a mountain. My trust has let me down a few times and I decided that it is better for me to hitch hike again instead of digging deep and finding the trust in me. It is hard to explain what happens when my mind crashes. I just get a total meltdown and panic attack on the bicycle. It is hard to breathe, which is essential while cycling uphill. I cry. My mind can only think: ‘this is not what I enjoy, this is not what I want and I can’t do this’. Over and over again. In 42 degrees, with trucks honking in my ears, sweet dripping in my eyes until they sting it is hard to see why I am doing this. Sometimes I can get out of this vicious circle by singing and focusing or looking at the view around me. Sometimes I am stuck. At the moment I am trying to re-find my mental elasticity and power. What the hell, I have cycled all the way to the south east of Turkey (minus 3 mountains which I hitch hiked)! I can be proud of myself for doing this and I can do this. Martin and I have talked a lot over the last few days and luckily he has been very open to what is going on in my mind. It is also not reassuring for him and the conversations are very heavily loaded but it is good to share feelings and thoughts. As it is now my body is feeling better (I think the low energy was the instigator of the whole battle), I am enjoying the travel experience in Hakkari, it is interesting here, and my mind is digging deep to find my pure motivation and thoughts on this life journey and bicycle touring. Before we reach Iran we have one more mountain to cross. The highest pass until now. I am determined to cycle up as slowly as necessary and hope I can find the strength and courage to tell myself that it is hard, but that it is okay and we will get there as long as we work together and trust in ourselves. Well done Sus! Respect, both for what youre doing and how you are writing about it. wij wensen (voor beiden) dat je in jezelf de kracht vindt om deze ernstige dip te boven te komen. Probeer jezelf onder deze zware omstandigheden ook eens te verwennen, met welke simpele dingen dan ook. Luister goed naar je lichaam en vertrouw op je gevoel. Bedankt, Jeanette en John! Het was inderdaad een ernstige dip en die is niet zomaar over, maar het gaat de goede kant op en ik begin weer meer vertrouwd te raken met mijn krachten de berg op. We houden beide moed! When the going gets tough just think of Holland getting into the finals of the World Cup :-)) . No seriously, having just returned to the U.K after cycling 4000miles solo from Aberdeen to Morocco I know that feeling. As a female doing it on my own with 70% of it wild-camping and now back in the U.K after a Tangier to London Gatwick flight and now in North Yorkshire with just 300miles to go I am completely and utterly physically and mentally exhausted and have had to stop an extra night here to catch up on rest. We all handle it in different ways, but I seriously commend you for your honesty and your desire to continue, but getting as far as you have and not continuing is no shame at all, esp after all the distance, terrain and countries you have been through, not forgetting the challenges of weather and climate. Sometimes a break for a week even will be just the ticket. Thank you for your comment! It sounds like we have been in a similar position. Especially being so close to the end of this adventure must be an overwhelming feeling for you. I hope you have been able to complete the last 300 miles in style. Really nice trip and brave to do it all by yourself! My mind is more at ease now, it helped to share my thoughts and to receive powerful feedback from people who care. Take care! Thank you for the pep talk! I know I can but the mind sometimes thinks differently… It helps to hear that I’m not the only one with these feelings. Nothing is easy! And what to expect? I keep my fingers crossed and do believe strongly that you can do this!! Come on Susan! You will find a way to do what is best for you! My best to both of you! Thank you, Stefan! We are finding our way. Nice to hear from you! Ik zeg, tijd voor een nieuw land, nieuwe ervaring, nieuwe mensen (die je overigens nog steeds volproppen met heerlijk eten). Na een weekje Iran en nieuwe ervaringen in het vooruitzicht komt het allemaal weer goed! Bedankt voor je bericht! Ja soms zit het mee en soms zit het tegen. Gelukkig gaat het inmiddels wel beter. We waren ook toe aan een nieuw land. Heel bijzonder om nu in Iran te zijn ook al is het ook heel intens. Hoe verloopt het allemaal in Teheran? Druk met visa? Susanne, you have to decide for yourself what you will see in the mirror every time from now on. 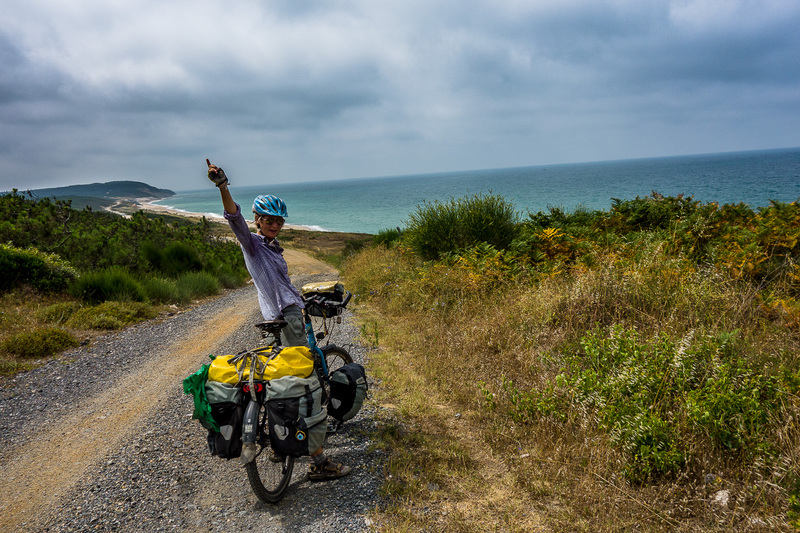 Do you want to see a beautiful young woman who has biked to the border of Iran, who is satisfied about that achievement and is now living an easy life of luxury? Or do you prefer to see a strong character who has overcome many major difficulties and hardships because she decided to fulfill her dreams? It’s really your own choice but if you want to be proud of yourself for the rest of your life I would suggest to press on. Martin will give you all the support you need. Other times may come when Martin has mental problems and then he would count on your support. You’re in this together. Really nice to hear from you again and with very wise words. I have decided to press on and although there will be a lot of hardship on the road ahead we will be able to deal with this together. It has been very special to share my feelings, very personal and having very special personal reactions. Thank you! Your spirit has definitely changed. You have to make yourself a promise. If it ever happens again that you can’t resist the honking trucks, you will go back to the point of your hike later and climb that tiny mountain yourself as soon as your spirit is back. Should you not do that, well, you would lower the barrier for quitting every time and you might as well quit there and then. Hitch hiking is for real emergencies like broken frames or broken legs, both legs that is :-). All other circumstances would be self-pity and you can’t allow that taking control of your dreams. I’m really impressed by your powerful mind and Martin’s support to get the best out of yourself. This is a once-in-a-lifetime experience that will become your trademark for the rest of your life. A good side of your interruptions is that it makes it easier for me to match your combined kilometrages. Since Feb 2nd my reading is 12,700 kms. Where are you at? Keep pushing those pedals in the best spirit! Nice post! All the best!!! Try to drink half liter of water on morning before breakfast to hydrate your liver. It’s help a lot. See you! Thank you Bertrand! At the speed you are going we will see you soon 🙂 thanks for the tip! Hi Susanne, I enjoy all your updates and envy your spirit! Maybe your body isn’t “sick” but it has been through some hard times and is just letting you know. I for one really look forward to enjoying a cup of coffee with you and hearing all about your trials and tribulations. I wanted you to know that we are thinking of you and wish you well “climbing that mountain”. Keep those wheels turning, you are doing well. Kay, it is great to know that we have a date in Kathmandu. Very motivating! 🙂 Beth, thank you for connecting us. Kay and I had short contact before we left and really nice to hear from both of you. Thank you for the nice words and see you in Kathmandu! Wow, thank you for letting me know 🙂 I always hoped to be an inspiration and this is very special. I hope your bike ride went well and you enjoyed it a lot. Where did you go? And keep the cycling spirit! Hoi Suzan, in 2008 heb ik, samen met een vriendin, een lange fietstocht gemaakt naar Nepal. In hartje zomer fietsten we door Turkije met 50 graden celcius over asfalt. Ik ben niet gemaakt voor de hitte en had behoorlijk vaak een mental breakdown (en vaak een fysieke :)) waardoor we vaak moesten stoppen en het gewoonweg wat rustiger aan moesten doen! Maar bedenk wat je allemaal al gepresteerd hebt! Als je hier doorheen komt met z’n tweeen dan kunnen jullie de rest van de wereld ook wel aan! Zet em op! Hou de banden vol met wind en blijf doortrappen! Dank voor je bericht. Het is erg fijn om te horen dat ik niet de enige ben met deze gevoelens. Het klinkt als een mooie reis die jullie gemaakt hebben. Heb je sindsdien nog reizen per fiets gemaakt? We gaan door en komen elke dag een stukje verder. Leuk dat je meeleest en fijn dat je een bericht achterlaat! Rustig aan, zorg voor jezelf en je lijf and yes you can do it!! You,ve proven that during the last six months! Why are you doubting yourself now? Yes because you, ve had a knock back being ill!!! Hitchhiking from now now on is forbidden Suus! Wil ik niet hebben, het maakt mij niets uit hoe vriendelijk de bevolking is, fietsen! Bedankt, mam! We doen het rustig aan en komen er wel. We hebben niet voor niets al 7000 km gefietst! En we doen voorzichtig, dat weet je 🙂 dikke kus en liefs!